by Barbara Rimkunas This "Historically Speaking" column appeared in the Exeter News-Letter on Friday, August 31, 2012. On Monday, September 9, 1912, most of the town of Exeter took the afternoon off to celebrate the dedication of the new high school on Linden Street. The Tuck High School replaced the old Exeter High School on Court Street, which lately had proved inadequate. With only 60 available desks, the 80 students who reported to school in September created quite a problem. But then, facilities for secondary school students in Exeter had been complicated for many years. A full four year high school education was still seen as a luxury at the start of the twentieth century. Students who intended to go to college needed the rigorous training in mathematics and Latin that a prep school provided, but those going into business or trades usually left school at the age of 16. Plenty of kids in Exeter applied for a work certificate at age 14 and dropped formal education. But if they wished to continue in school, there were three options in town. 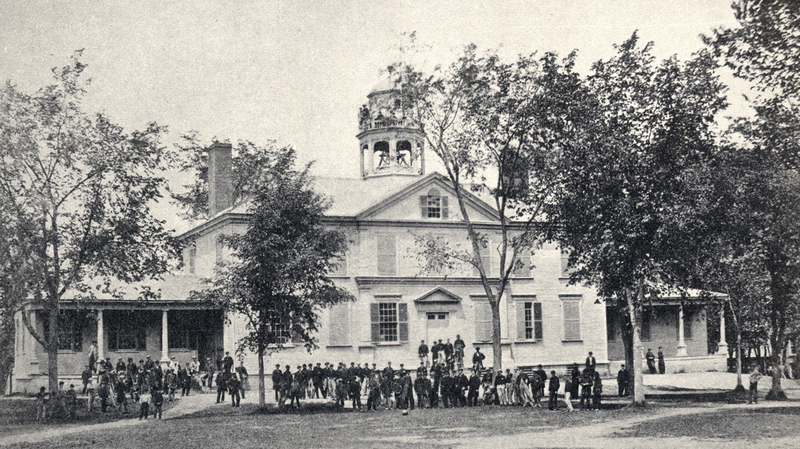 From 1781, Exeter was home to Phillips Exeter Academy – a college preparatory school for boys. With a long list of notable alumni the Academy had a solid reputation for a well- disciplined course of study. Exeter’s meager high school, opened to both boys and girls in 1848, paled somewhat in comparison. Girls would sometimes choose to attend the Exeter Female Academy, but this was considered primarily a finishing school with an emphasis on embroidery and deportment. In 1864, an Exeter native, William Robinson, left the town funds to build a girls school that would rival the education the boys at Phillips Exeter Academy received. 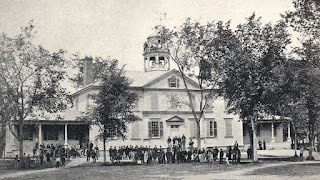 The new Robinson Female Seminary opened in 1867 and all the girls in town were removed from the coed grades of 6 through 12, leaving the boys on their own. This odd three tiered educational system continued for years. Boys heading for college went to the Academy, girls – whether college prep or not – went to the Seminary, and the residual boys went to Exeter High School. One such boy, Ralph Adams Cram, seemed perfectly content to graduate from Exeter High School in 1880. Cram, who was born in Hampton Falls, was the son of an Academy graduate. In spite of what many would perceive to be a ‘lesser education’, Cram went on to become a prominent architect in Boston. In 1908, the school board made the decision to improve the academics at Exeter High School. Too many boys, it seemed, were transferring to the Academy to take the courses required to get into college. A more rigorous four-year curriculum was developed including Latin, higher mathematics, physics and chemistry. 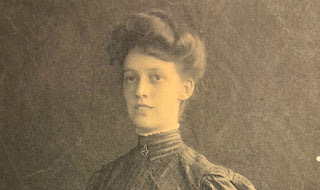 Miss Gertrude Bartlett was hired as the physics and chemistry teacher and by 1910 the school board could report, “a good supply of apparatus has been furnished for her use.” Understanding that not all of the boys intended to go on to higher education, a business and manual education course was included for them. Since nearly the entirety of high school was still considered optional, the board seemed a bit perplexed that so many boys enthusiastically requested the entire program and worked toward their high school diplomas. The school board report of 1910 pondered, “Ought it not to be a matter for congratulation to the citizens of Exeter that the high school has out-grown its present quarters?” The only solution was to build a bigger school. A building committee was formed with the task of designing a high school for boys that would accommodate at least 120 students. Phillips Exeter Academy was happy to swap a piece of land on Linden Street for an old Spring Street School property, so the new high school had an admirable site. The architect chosen was none other than Ralph Adams Cram, class of 1880. Cram’s firm was also working on plans for the Davis Library at Phillips Exeter Academy. The cornerstones for both buildings were dedicated on the same day – October 26, 1911. 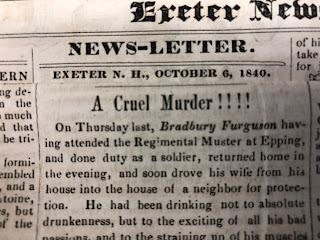 But Cram’s design was a bit too expensive for the Town of Exeter. Donations were sought, the largest coming from Edward Tuck, who graciously agreed to donate $5000.00 providing the high school was named in honor of his father, Amos Tuck. 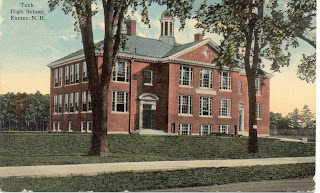 Tuck High School served as the boys’ high school in Exeter from 1912 to 1955 when the girls of the Robinson Female Seminary joined them. 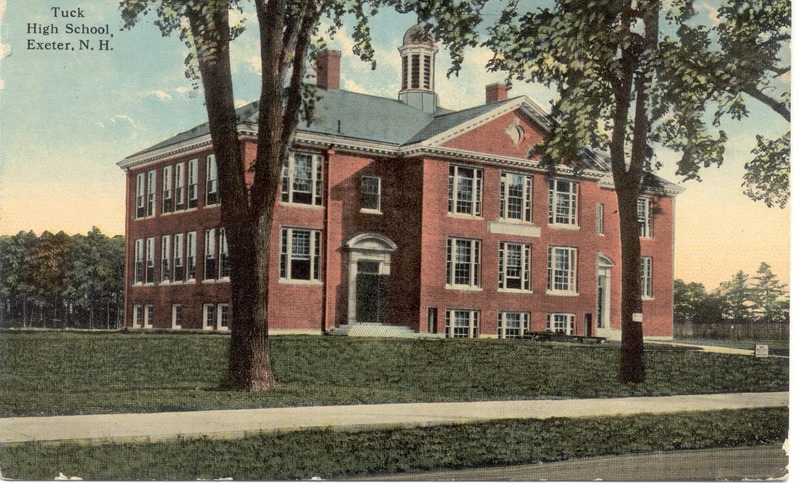 The building was expanded in size and the Talbot gymnasium added to accommodate the new coed student body, and the ‘Tuck High School for Boys’ became Exeter High School. By 2000, it was clear that the aging school was again too small for the student body. Additionally, new technologies were needed to educate students in the new wired world of the 21st century. The high school students moved out in 2006. Today, called the Tuck Learning Center, the old building has a new life as the offices of SAU 16 , Exeter’s Adult Education Program and various other organizations. Still elegant and dignified at the age of 100, the building continues to serve as an educational home to the town of Exeter.